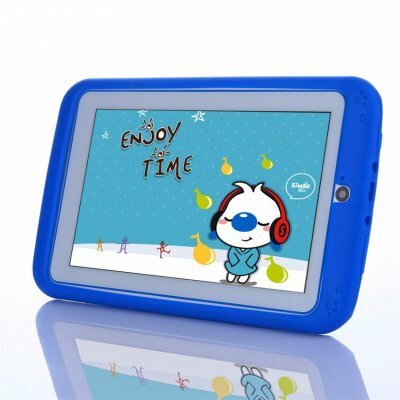 Successfully Added Android Tablet Computer Blue– For Kids,7 Inch Display, HD Visuals, 3000mAh Battery, Sophisticated Hardware, WiFi to your Shopping Cart. This cheap tablet PC is a perfect gizmo for your son or daughter to enjoy films, Apps, and games on the go. With its sophisticated hardware, this Android tablet PC allows your child to tackle all the basic software features out there. The tablet PC comes equipped with a crisp 7-Inch HD display on which it brings forth stunning detail and visuals. With its 8GB ROM and 32GB SD card support; it holds plenty of space for your son or daughter to store all her files and media. The Android tablet PC even comes with a built-in 0.3MP camera. This snapper lets you shoot beautiful pictures and engage in HD video calls with family and friends. With its Android 4.4 operating system, a smooth and lag free user experience is guaranteed. The Android tablet packs a whopping 3000mAh battery that brings forth enough power to get you through 3 hours of continuous usage time. Thanks to this, you won’t have to worry about it running out of juice in the middle of the day. For increased connectivity, the tablet PC treats you to Bluetooth 4.0. It furthermore comes with WiFi support that lets you stream and download media straight from the web onto your tablet PC. This Tablet PC comes with a 12 months warranty, brought to you by the leader in electronic devices as well as wholesale Android tablets..